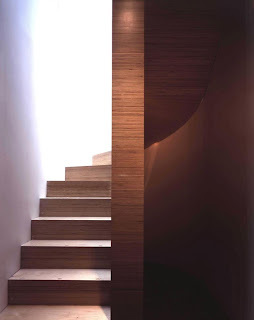 +ARCHITECTURE FIRM ELRIDGE SMERIN, DESIGNS A WILD STAIRCASE FOR SALE TO THE PUBLIC AS AN IMPLEMENT TO YOUR HOME. MINIMAL LINES AND INTERESTING FORM+THIS LONDON BASED FIRM DESIGNS MODERN MASTERPIECES RANGING FROM RESIDENCES TO YVES ST. LAURENT STOREFRONTS AND INTERIORS. CHECK OUT THE "Shed Private Members Club London"